Tonight, when #1 Notre Dame plays #2 Alabama for the BCS National Championship at Miami's Sun Life Stadium, Alabama head coach Nick Saban will be on familiar turf: He called the field home during the 2005 and 2006 NFL seasons, when he was head coach of the Miami Dolphins. His presence in the title game makes him a serious candidate for Greatest College Football Coach of All Time. In the past decade, which includes his two years with the Dolphins, he has won three college national championships. In 2010, he joined Pop Warner as the only head coach to win a national championship for two different schools. 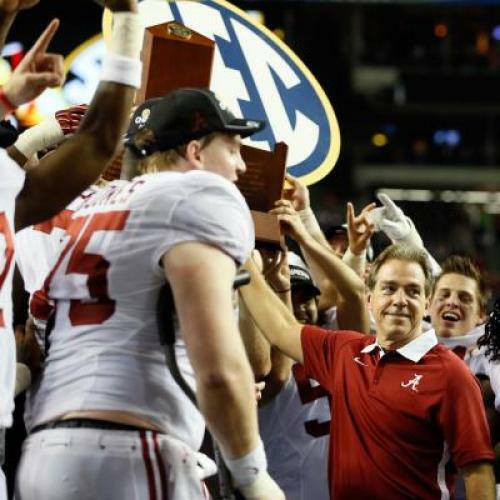 Including bowl games, Saban’s record at Alabama is 67-13, and overall as a college head coach, he is 158-55-1. In his two seasons with the Dolphins, however, as he struggled to adjust to the pro game (or, at least, struggled to revive a franchise that had gone 4-12 the previous season), Saban went 15-17, including his only losing season as a head coach at any level. And nothing in his tenure became him like the leaving it. Near the end of the 2006 season, with rumors swirling, Saban told reporters, “I guess I have to say it. I’m not going to be the Alabama coach.” Fewer than two weeks later, he was the Alabama coach. Many called him a liar and a traitor; a few noted, more forgivingly, that it would have been inappropriate for Saban to announce he was leaving before the Dolphins’ season ended. But the most revealing aspect of Saban’s exit, which gets to the heart of what has made him the most efficient and accomplished coach of the BCS era, is that it was clearly the correct one. Simply put, Saban is better at coaching college kids than professional adults. When Saban was offered the Alabama job, he had all the leverage. Arguably the winningest program in history, Alabama had won only one national championship and three Southeastern Conference titles since the legendary Bear Bryant retired in 1982. Previous coach Mike Shula—ironically, the son of longtime Dolphins coach Don—had managed only one winning season in his four years. Meanwhile, Urban Meyer’s program at rival Florida looked unstoppable. Only a few years earlier with Louisiana State, Saban had proved he could build a national champion in the SEC—and was rewarded with a huge, five-year contract with the Dolphins. To lure him, Alabama had to give him everything he wanted, which they did. In terms of personnel, having final say in the NFL allows you to draft players and make trades, but you are still constrained by a league-wide salary cap and you still compete against 31 other teams with roughly equal resources. By contrast, at Alabama, Saban gets to seduce several dozen new players each year from a national talent pool, in no small part by holding out the promise of an unusually well-endowed program. He is also able to cut them virtually at will and plug in the next guy, with no competitive consequences (in the NFL, you would take a massive salary cap hit). Of all Saban’s skills, recruiting is his strongest. He is so persistent that when the NCAA banned spring high school recruiting visits, it was dubbed “The Saban Rule.” (In response, Saban switched to video-conferencing.) Saban is routinely accused of “oversigning”—promising more scholarships than NCAA regulations permit, and then cutting players who don’t work out—and there has indeed been futzing with these rules. No scandal yet, though. It is early January, a time when the chattering classes guess which college coaches might fill one of several—this year, seven—coaching vacancies in the NFL. The betting money is that Oregon’s innovative Chip Kelly will make the move to the Big Show—he's already met with the Cleveland Browns and Philadelphia Eagles—but there has also been talk of Saban heading to the Browns, where he worked 20 years ago and where recent Alabama alum Trent Richardson is the starting running back. The scuttlebutt, however, is that Saban is staying put—as he probably should. There is a long track record of college coaches dipping their toes in the NFL, only to step back after a couple of disappointing seasons. (In the NFC West, San Francisco’s Jim Harbaugh and Seattle’s Pete Carroll are currently bucking that trend.) That’s partly because the college and pro games are remarkably different in terms of strategy, but it is also because the college coaches are used to a level of control over their players and teams that is impossible to enjoy in the pro game. Given that Saban has made greater use of that control than any other coach in history, one imagines the healthy 61-year-old will instead elect to stay put and make more history—tonight, the Crimson Tide are favored by more than a touchdown—for a decade or more. Be impressed, but don’t be too impressed. Alabama has a lot more than 31 teams to compete with for the title. But the restrictions in the NFL, from the salary cap to player independence, make being the head coach of professional team an endeavor where success is more directly correlated to actual football prowess than being the head coach of a college team is. And there is something decidedly sour about building your legacy via the exertion of near-totalitarian control over your players and rigorous-to-borderline-illicit recruiting, especially when such methods are permitted only because your players are barely adults (and barely compensated). Saban’s most successful season in the pros came in 1994, when he was the Browns’ defensive coordinator. They went 11-5 and won a playoff game on the strength of one of the league’s best defenses. From Bill Belichick, his boss at the time, Saban learned the importance of systems, of preparation, and above all of control. Belichick’s control-freakishness is legendary, of course. But it is necessarily limited by all the circumstances involved in coaching in the NFL, circumstances that have not prevented him from reaching five Super Bowls and winning three as head coach of the New England Patriots. As Saban enters his old home field tonight, the alternate universe in which he challenged himself to be a better pro coach instead of falling back on the college game should not be forgotten.